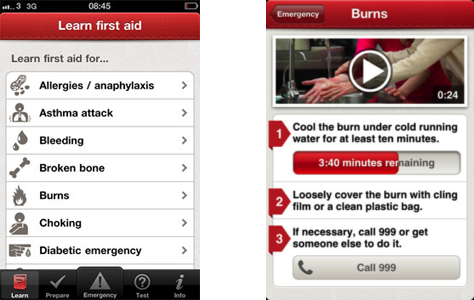 The British Red Cross wanted to develop a mobile phone app offering people quick and practical first aid advice. We worked with the British Red Cross and development team, 3 Sided Cube, to uncover how people would use the app to apply simple first aid in an emergency. We conducted 2 rounds of research in the lab on Android, iOS and Blackberry devices. Crucially there was a week gap between the 2 rounds of research. This allowed the development team to refine the prototypes based on audience feedback. During the lab sessions participants were asked to imagine themselves in real life scenarios, where first aid would be required. This approach allowed the team to see first hand how people would naturally use the app. A significant portion of the audience were recruited to have little to no first aid knowledge. We used a CPR mannequin to see how participants would use the information in a practical situation. We quickly delivered a design checklist and a list of improvements, after each round of research. This ensured the team could quickly respond to the feedback and implement rapid changes. Our final report contained a list of outstanding issues and a list of success criteria. The app has now been launched on the 3 mobile platforms and has been very highly rated. It has been recommended in the national press, and has an average rating of 4.5 stars on iTunes (from over 1800 ratings in less than 6 months). In the same time period the app has received an average rating of 4.7/5 (over 600 reviews) on Google Play.